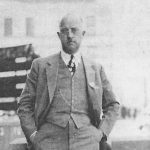 Dr. Charles Anderson Lockwood was born on the 21st of May, 1896 near Mt Brydges in Caradoc Twp., Middlesex County. His parents were Charles Henry Lockwood and the former Edith Mary Grant and they were farmers. Dr. Lockwood was the 3rd of 7 children. His siblings were; Grant, Frederick, Harry, Edith, John and Kathleen. 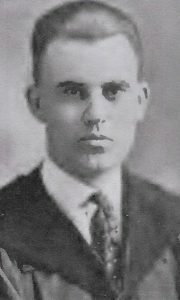 Dr. Lockwood enlisted in WWI on the 27th of May, 1918. On his enlistment documents, he stated that his occupation was a farmer. 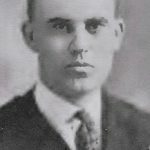 After his service to his country, Dr. Lockwood enrolled in medicine at the University of Western Ontario. He graduated M.D. in 1924. Dr. Lockwood married Phyllis Irene Hallett on the 18th of September, 1926 in London, Ontario. Mrs. Lockwood was born on the 13th of March, 1904, the daughter of Frederick Augustus Hallett and the former Ocenia May Corfield. She was the 4th of 5 children. Her siblings were; Elizabeth, Augustus, Francis and Aileen. Dr. Lockwood’s practice was located in Newbury (Middlesex County). Birth and death records in Kent County record that Dr. Lockwood attended to patients in Bothwell, Zone Twp (Kent County) and Thamesville. Eventually Dr. Lockwood moved his medical practice to Glencoe (Middlesex County). Mrs. Lockwood died on the 20th of July, 1945. She was 41 years old. Dr. Lockwood retired around 1974. He died on the 13th of December, 1991. At the time of his death he was married to Edith Gertrude Earle who was a registered nurse. Dr. Lockwood was the father of a son and a daughter.